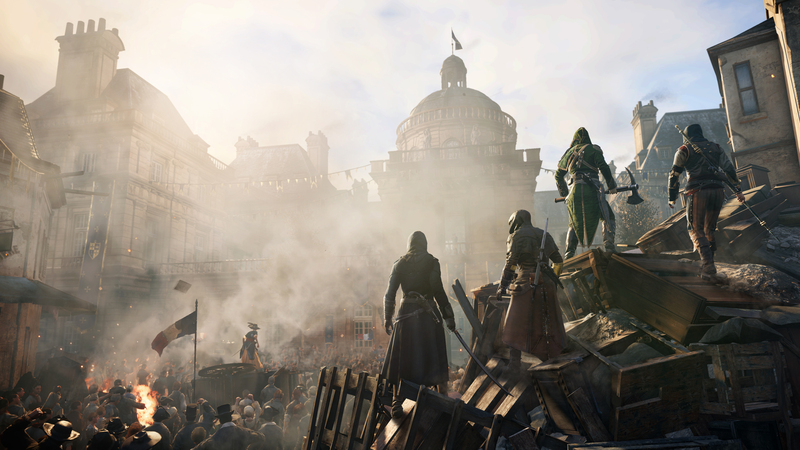 The Assassin's Creed series pushes forward with huge crowds, new combat, and public beheadings. 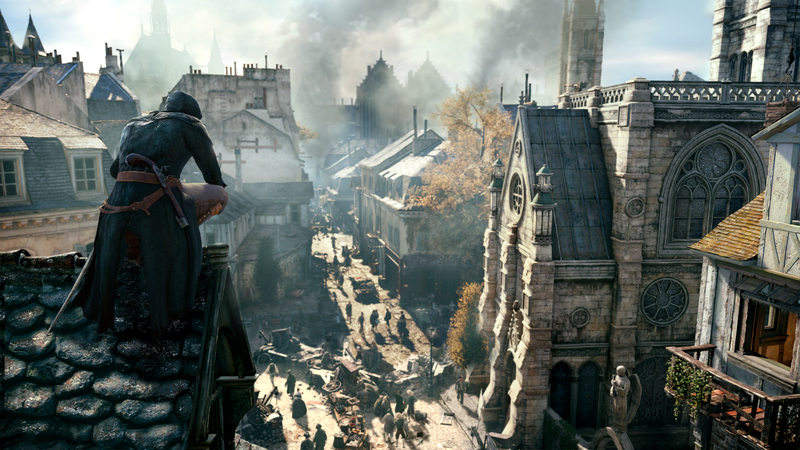 Update: Andrea Rene visited the Assassin's Creed Unity booth at E3 and spoke with Ubisoft Creative Director Alex Amancio. Original Story: It's Paris, 1793, and the French people are not happy. A headstrong, corrupt king has just been murdered, and there's unrest in the streets. 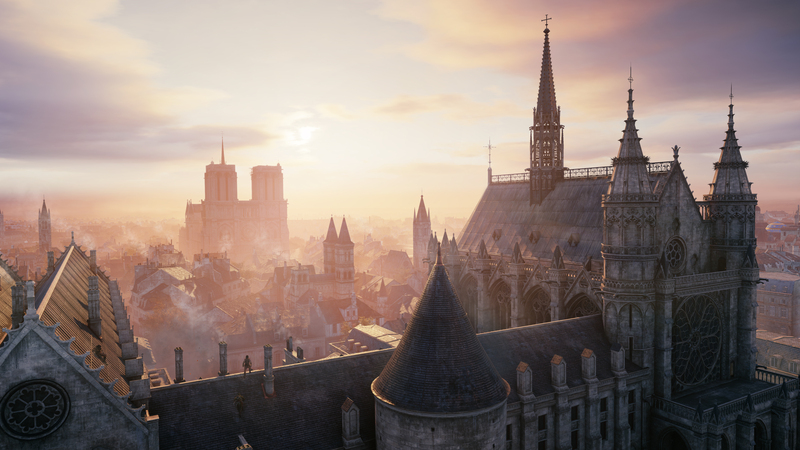 This vision of turn-of-the-century France sets the stage for Assassin's Creed Unity, and I got a hands-off look at the next title in Ubisoft's flagship series at E3 today. As an Assassin's Creed devotee (and obsessive Les Miserables fan) I couldn't help but be drawn to Unity's gameplay and setting. Not surprisingly, what I saw left me extremely impressed. 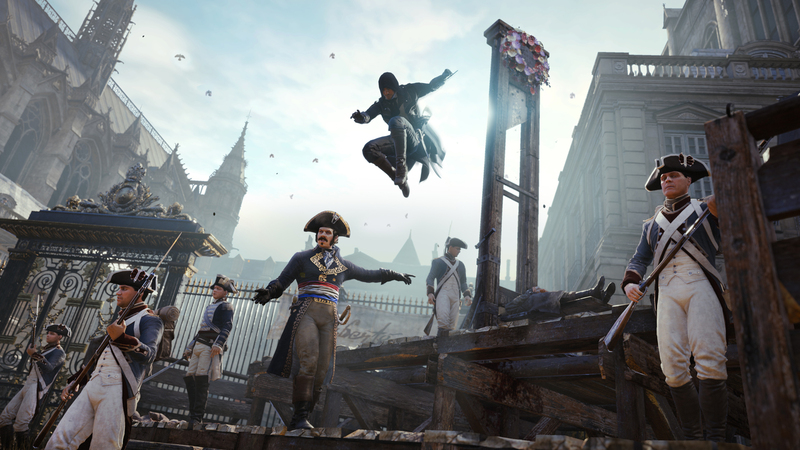 The Reign of Terror is underway in Paris, and Ubisoft's Antoine Fortier-Auclair stressed how unhappy its citizens were at this point in history. There's unrest in the streets, and boy, are those streets crowded. 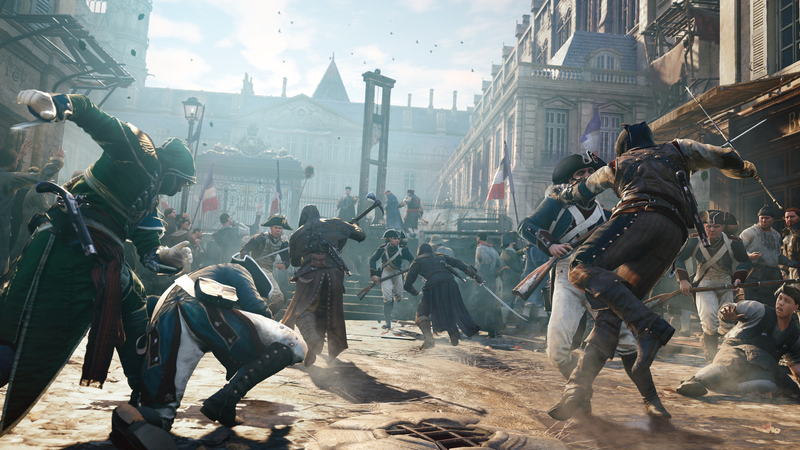 When asked why Ubisoft chose the French Revolution as the setting for the next Assassin's Creed, Fortier-Auclair said that it was a period often requested by fans, but next-gen technology has allowed the developers to capture the movement and sheer numbers of Parisians adding to the growing unrest in France's capital city. 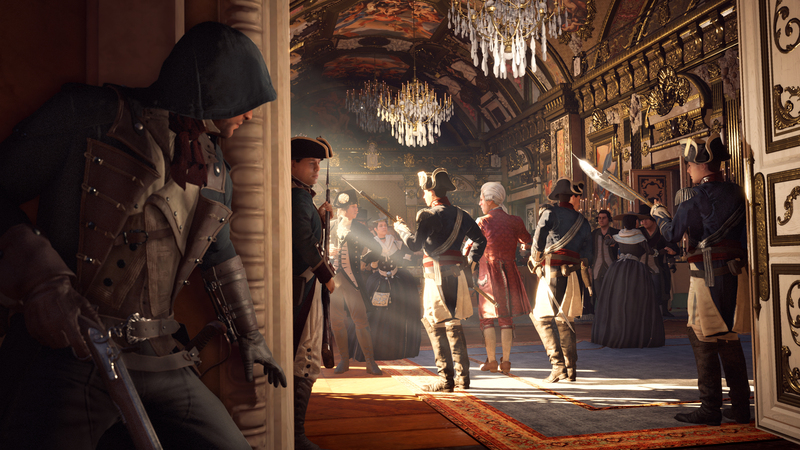 The amount of people onscreen at once isn't the only change to come to the Assassin's Creed franchise when Unity launches later this year. Aside from minor aesthetic choices, there are some significant differences that, according to Fortier-Auclair, were driven by fan feedback. For instance, there's a new combat system that does away with counter attacks; instead, a parry system allows the player a chance to attack or dodge, depending on the situation. This is meant to make combat a little more challenging, which is something that players really wanted. There's also a dedicated stealth mode in the form of a crouch system; the player can now sneak around more easily. As he played, Fortier-Auclair pointed out different ways that situations could be approached: do you sneak in through the door and tiptoe around or climb through the window? I appreciate that fans wanted to be able to take a stealthier approach, but as someone with no patience for that, I'm glad it's an option and not mandatory for gameplay. Though the demo covered familiar ground to those who watched Monday's press conferences, I was again treated to a demonstration of how player choices could change a situation. For instance, instead of using a ranged weapon, Fortier-Auclair said he was going to eliminate his target publicly. This would be symbolic, since those in power were publicly beheading citizens in the street. As the guillotine fell on one unlucky soul, the assassin found his mark, leapt from above, and his blade found its target. The streets erupted in chaos. 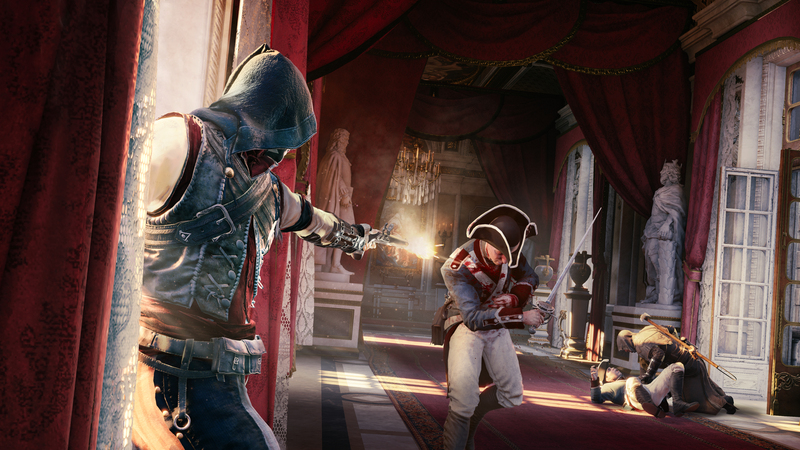 An Assassin's Creed game wouldn't be complete without a rich world of side missions, and it appears that Unity will get rid of some things that used to slow the player down. I couldn't help but comment on the lack of loading screens every time Fortier-Auclair had assassin Arno Dorian enter a building, and he said that the world was much more accessible all at once this time around. There are plenty of side missions, including murder mysteries, and icons on the main screen alert the player to these opportunities, so there's no need to keep bringing up a map screen. Assassin's Creed IV: Black Flag may have looked stunning on Xbox One and PS4, but Unity appears to be truly pushing the series forward in terms of actual next-gen features. That's not to say it doesn't also look good, because boy, is it pretty. 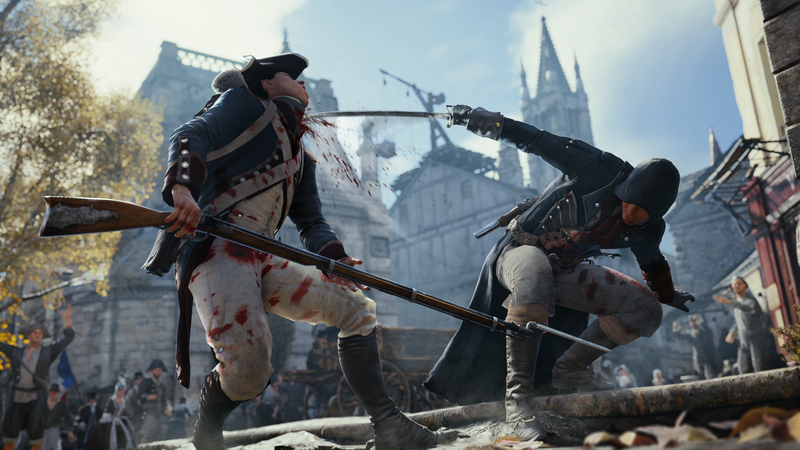 As always, the developers of Unity have tried to be extremely respectful of the historical time period, incorporating real events like the storming of the Bastille and the killing of King Louis XVI into the story. It's not actually Assassin's Creed: Les Mis (though I was pretty surprised when Fortier-Auclair told me he hadn't heard anyone call it that), but it is a fascinating new chapter in the series that I can't wait to explore when it launches for the Xbox One, PS4, and PC this October.